Hi there! Today I’m kicking off Enemies to Lovers Week with a review for a sweet New Adult M/M contemporary romance from Anyta Sunday. SCORPIO HATES VIRGO is the sequel to LEO LOVES ARIES, but can be enjoyed on it’s own. A grieving young man endeavors to sell his late-aunt’s home and start over fresh where the memories of her love won’t haunt him. Especially important is leaving behind his childhood nemesis/crush but the well-meaning neighbors, and their paired horoscopes, seem to get in the way. It’s a sweet slow burn, and I really enjoyed it. Percy’s dear Aunt Abby had died about six months ago, she left him her home–the home where he was raised after his parents made no secret of wanting him gone when he came out in his teens. It’s a bit run-down, but still got great bones and a close-knit cul-de-sac community of neighbors who keep tabs on everyone, plan fun get-togethers, and lend a hand when needed. They were among the chief mourners at Abby’s wake, and though Percy knows they truly care for him too, he wants to sell the house and move away. He’s recently broken up with another boyfriend–who thinks he’s not family material–and he just wants to start over. But, Callaghan Glover, neighbor and long-time nemesis is becoming a constant presence in his life. Cal should be at school, finishing his masters in paleontology, but he took a break and came home to help care for his pregnant mother and two younger sisters now that his dad had an existential crisis and moved out. Percy has always harbored a secret crush on Cal, but he knows it’s pointless, because Cal’s straight. Still, both of these guys need a solid friend, and their verbal sparring moves from waspish to bantering, confusing Percy more. Add to this, the cul-de-sac community is playing a “Sherlock Gnomes” game where they secretly leave treats or take on chores for their fellow Gnomers–all while trying to determine which neighbor is operating under which Gnome name. And Cal’s mother makes Percy a standing invitation to share their dinners so he doesn’t have to eat alone. The community that Percy feels, even as he’s sorely missing his aunt, gives him the strength to reach out for what he wants–to build a lasting relationship. It takes a LOOOONG time, but Percy realizes that one of the Gnomes he’s been chatting with (and pouring out his soul a bit to) isn’t the person he expected, and that Cal may have been tipped off about Percy’s attraction. Percy is, meanwhile, building stronger roots of his own, developing a clientele of folks in their community for his massage therapist gig. Including Cal who’s hurting his back entertaining his young sister with dinosaur antics. I liked how Percy and Cal took things slow, it’s a tricky business going from enemies to friends to lovers. Cal’s own need, as a Virgo and a demipansexual, is to build a strong emotional connection before he can get physical, adds to that slow burn. Meanwhile, Percy’s hide-behind-the-sarcasm Scorpio ways makes getting close a challenge. Their love may not have been written in the stars, but it certainly burned bright enough to make Percy recognize his place in life was the one he tried to run from. Fun and creative, I enjoyed this one. Interested? 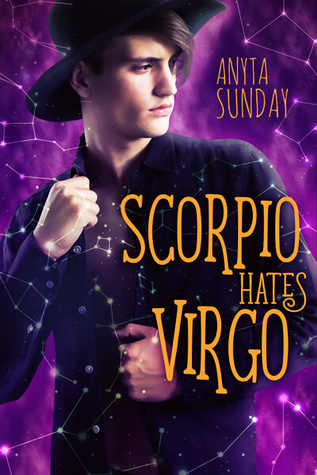 You can find SCORPIO HATES VIRGO on Goodreads and Amazon. I received a review copy via NetGalley. Some of my favorite tropes to read and write are: Enemies to Lovers, Friends to Lovers, Clueless Guys, GFY/OFY, Bisexual, Pansexual, Demisexual, Oblivious MCs, Everyone (Else) Can See It, Slow Burn, Love Has No Boundaries. If you’d like to check out more of my stories, check out my website, Facebook and twitter.